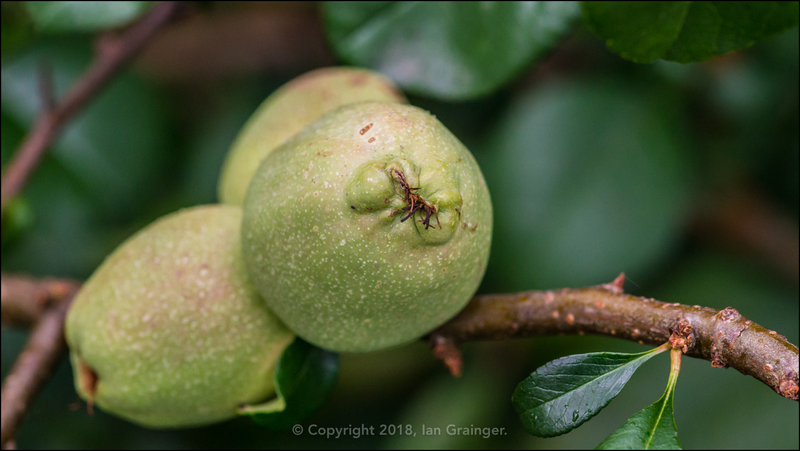 After the run of gorgeous weather we'd endured this summer, the last couple of weeks had been a bit of a disappointment, and the weather for my Sunday morning photo shoot this week wasn't any better. There were dark grey cloudy skies, and a persistent drizzle that soaked you in minutes. If it wasn't for the warmth and humidity, you'd be forgiven for thinking it was more like a November morning than an August one. 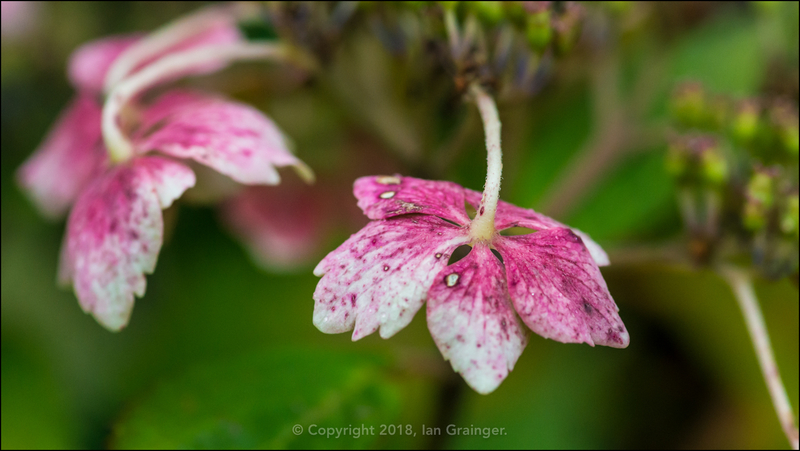 Even the plants looked like they were getting ready to settle in for the winter, with the bracts of the Lacecap Hydrangea (Hydrangea macrophylla) bushes already starting to fade into their autumnal colours. 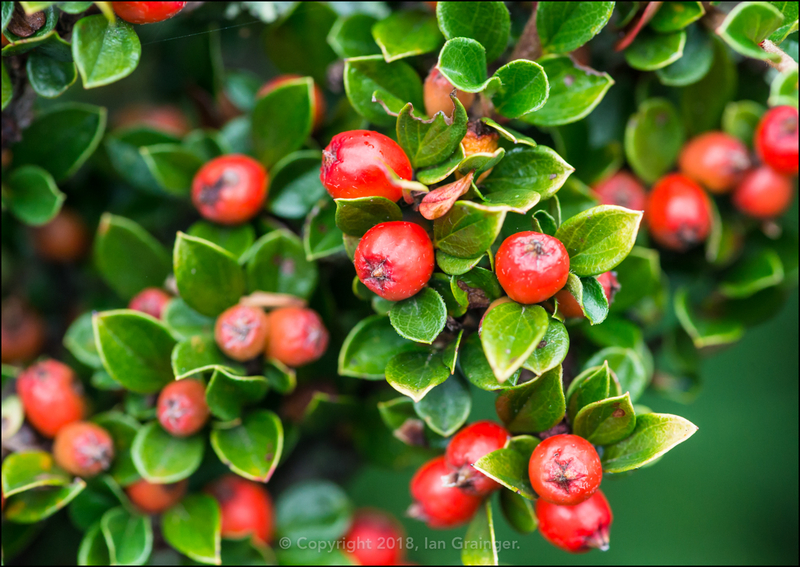 The Cotoneaster bushes in dad's garden also seemed to be very early in displaying their bounty of berries. Even the Crocosmia 'Lucifer' (Crocosmia curtonus) plants were already getting ready to cast out their seeds. 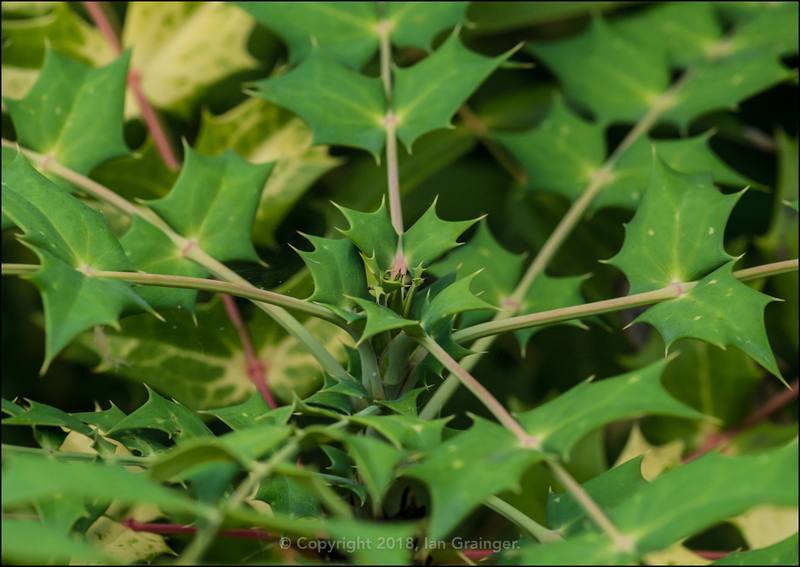 The Mahonia (Mahonia japonica) bushes were also putting on lots of new growth, ready to flower over winter. The Clover (Trifolium) had finished flowering, and the leaves were looking quite lush, despite the lack of major rainfall. 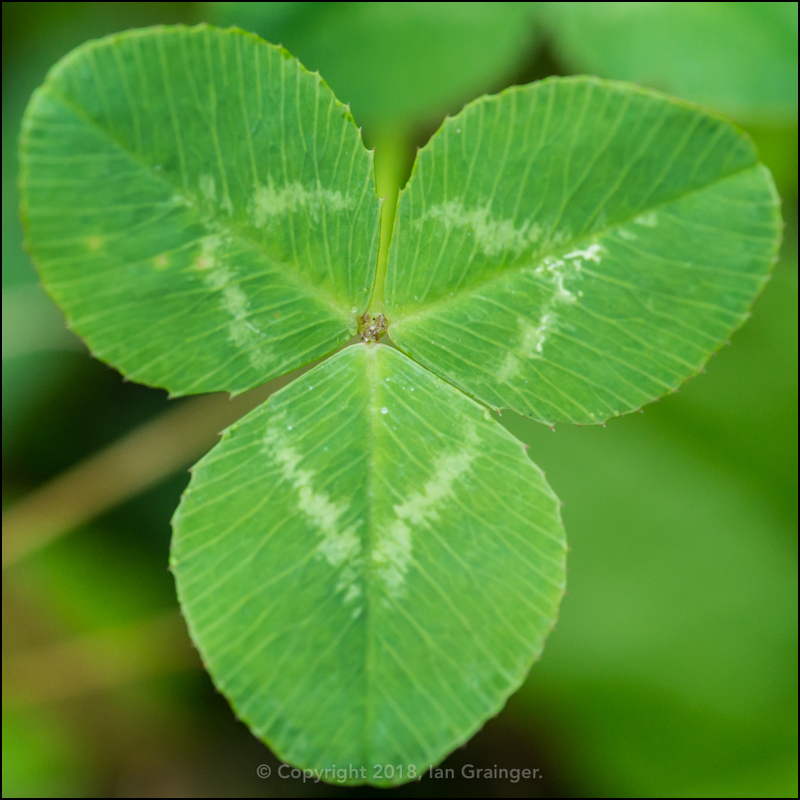 I'd never noticed that the three leaves were also accompanied by the triangular shape tracing between them before. 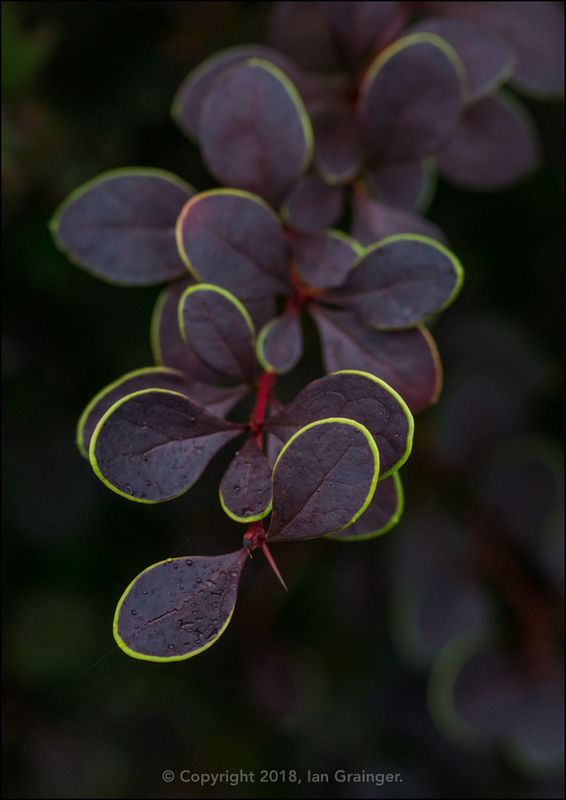 The Barberry (Berberis) bush was looking different this year. 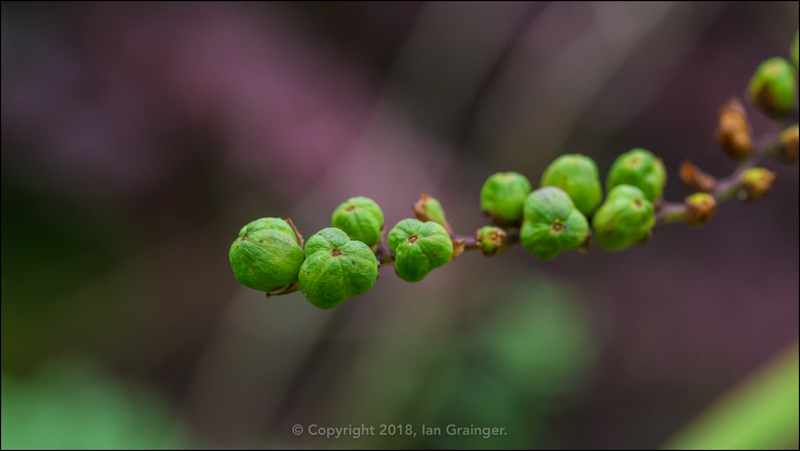 All of the leaves were normally stripped off by Berberis Sawfly (Arge berberidis) larvae, but this year they seemed to have been left alone. I quite liked that the dark red leaves were outlined in a yellowy green. There were still a few flowers waiting on their big moment. 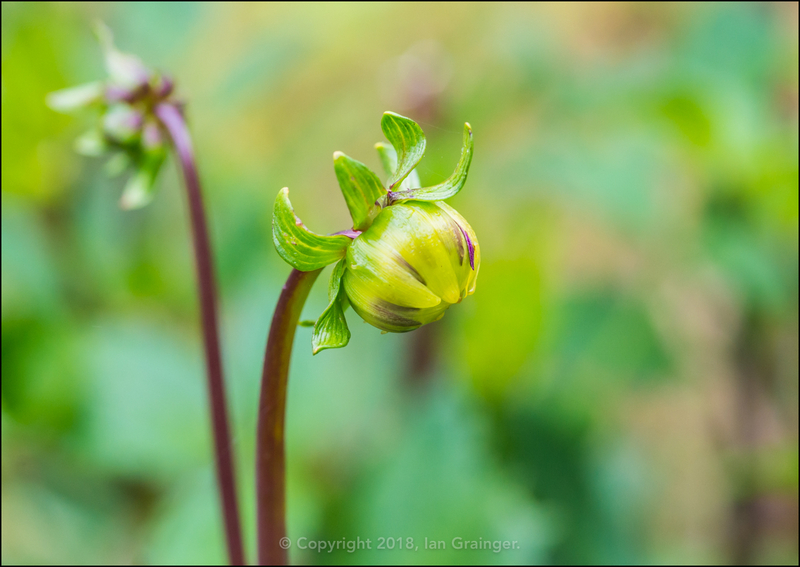 This Dahlia 'Nuit d'Ete' would surely be opening any day now. 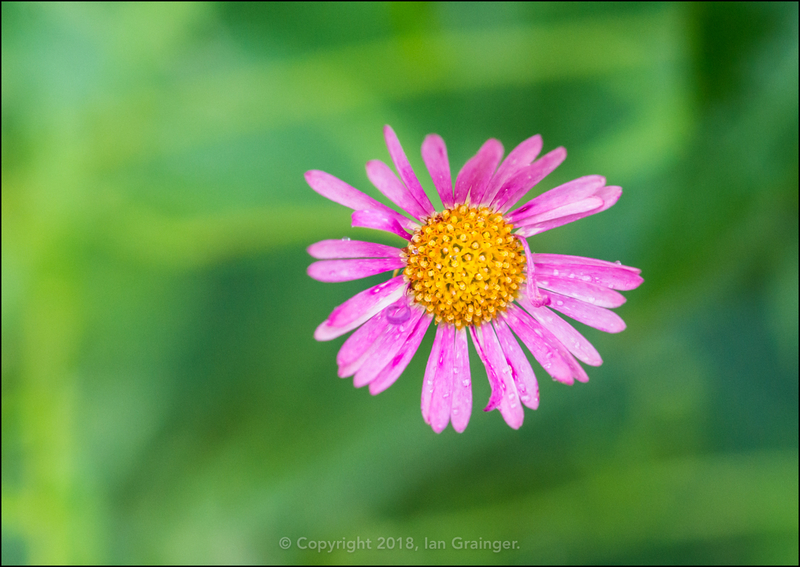 Meanwhile the Erigeron (Erigeron karvinskianus) 'Stallone' blooms were turning from white to pink, which I think I preferred. 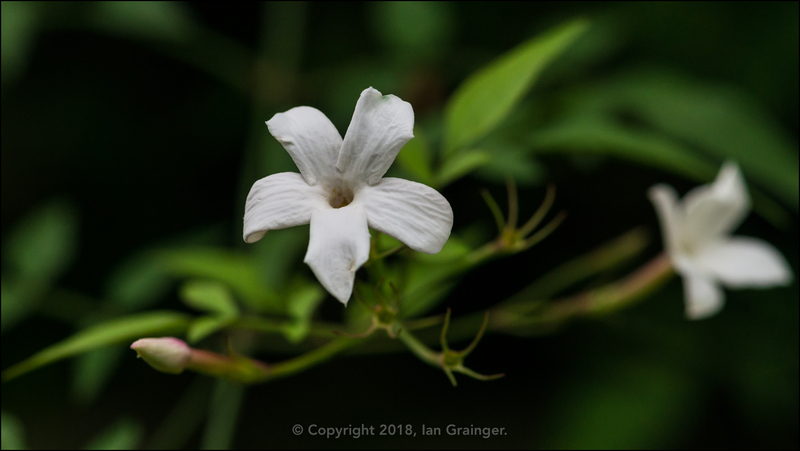 The Summer Jasmine (Jasminum officinale) was just about finished, with only a few remaining blooms hanging on. 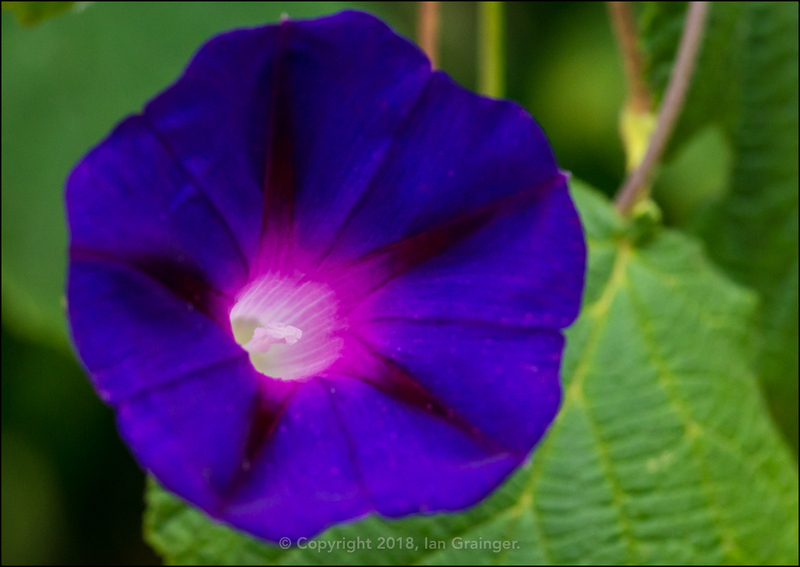 The cultivated Morning Glory (Ipomoea purpurea) flowers were mostly hiding, although a few were open. 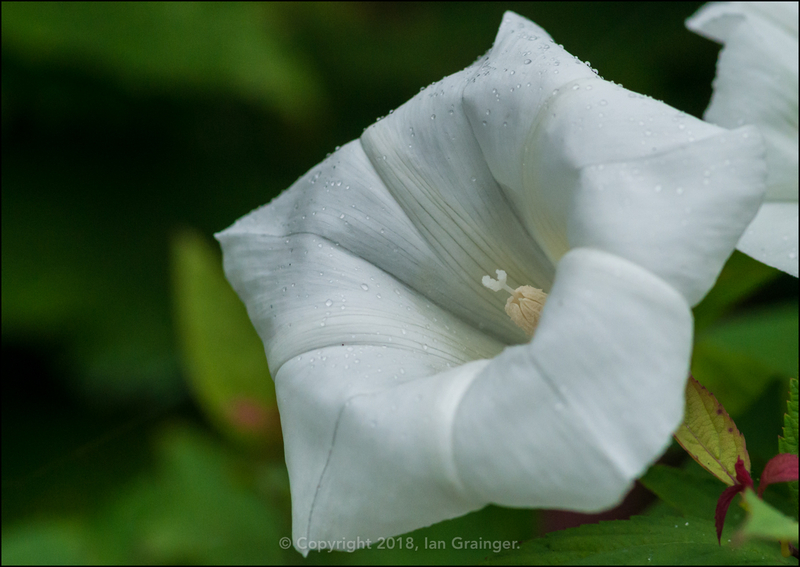 In contrast, flowers from the similar Bindweed (Convolvulus) plant family were nearly all open. 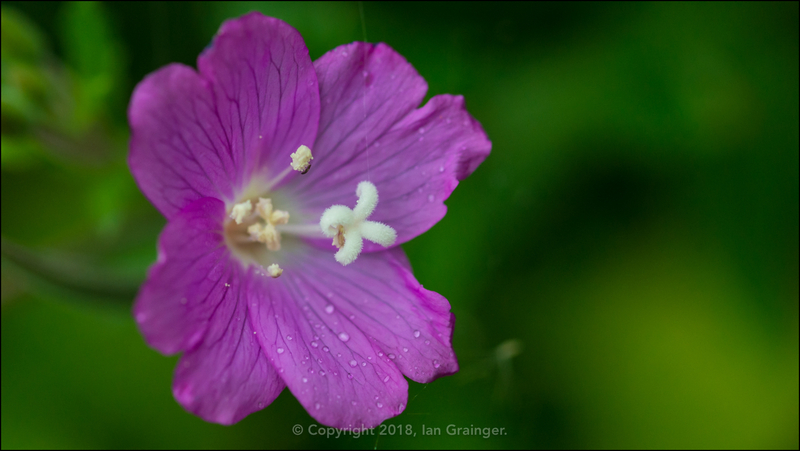 Another weed putting on a good display, whatever the weather, were the Great Willowherbs (Epilobium hirsutum). There weren't that many plants this year, but they were all covered in flowers. 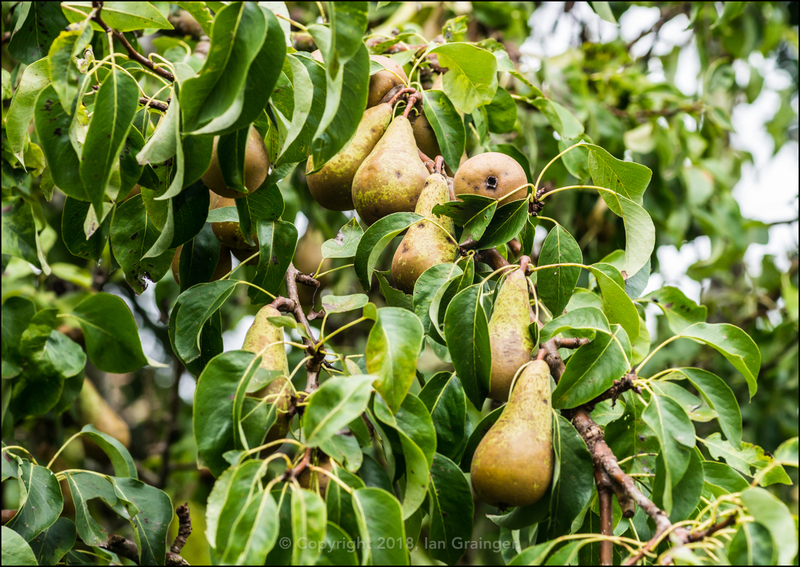 ...and the branches of the Pear Tree (Pyrus) being laden with pears. Finally, my fishy friends. This may look a little odd, but I find it quite fascinating! 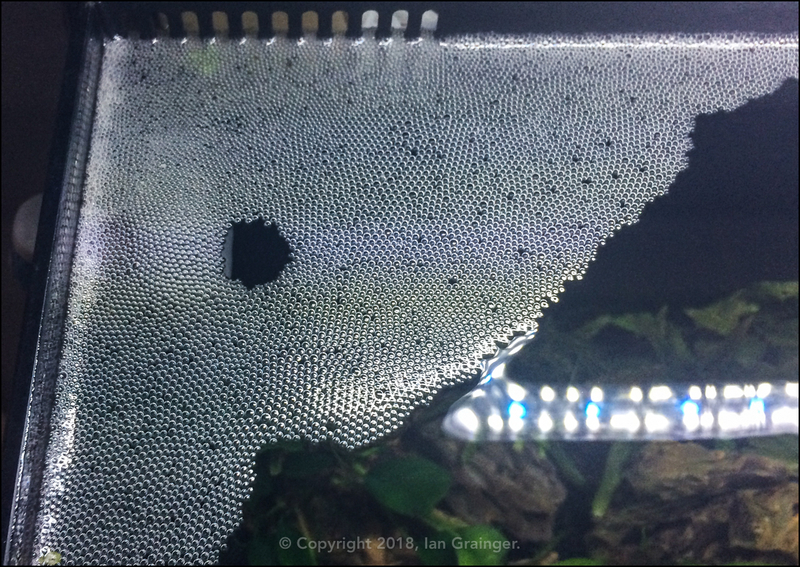 It's a bubble nest created by one of my trio of Honey Gouramis (Colisa chuna). The female releases her eggs into the nest and the male guards them until they hatch. He will chase away any other fish that goes too close to the nest. He will also repair the nest when holes appear, and will return any eggs that fall from it. Eggs will usually hatch within three days. Unfortunately, this nest has been built too close to the filter intake so will probably be swallowed up quite quickly.